This was the outfit I wore on Tuesday to unpack my boxes in a brand new office. I have to take pictures of my view, its pretty amazing plus since no one has ever been in the space before everything is shiny and clean and new. It was nice that that worked out since my camera+remote was very uncooperative that evening. Don't let the pretty sky deceive you, there was a biting cold wind, which made the pictures without my jacket hard to take without curling into a ball on the muddy grass. Anyways, the whole outfit was a pretty even mix up of vintage and new clothes which can help turn something as simple as black pants and a white sweater into an outfit. Vintage: making over sleeping and picking out my clothes easy since 2006. **Also, check out the awesome vintage coach bag for sale! Oh, you look so lovely and classy! That vintage jacket is pretty much perfect. 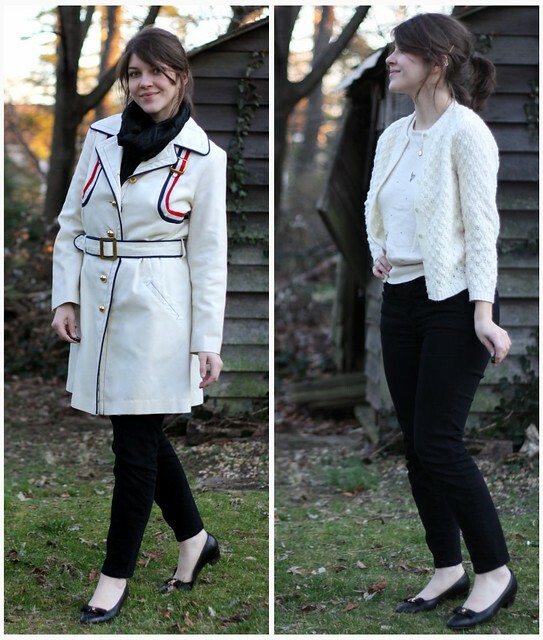 I would love to find more timeless vintage pieces that I can just throw on and instantly look put together! That jacket is great and you look so damn classy! Love this. it fits you perfectly..you look absolulty lovely. i love love the cardigan! that coat is so awesome!! Great jacket. And you look really good in pants. 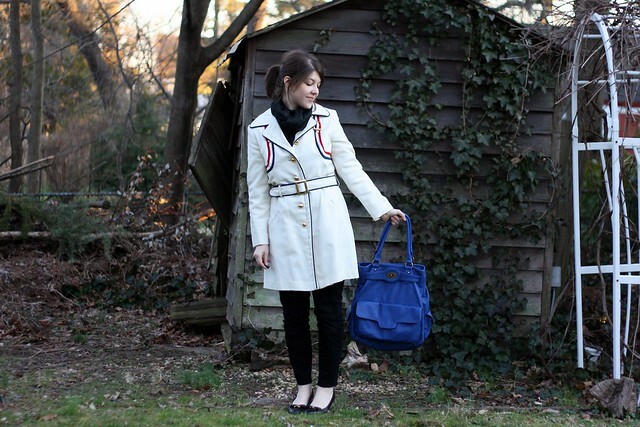 The trench looks so french with the red and blue piping, love it! Fabulous coat...and then there's your amazing bag! You look lovely. I love each of the pieces you have on. Especially that amazing coat. That coat is actually perfect. And I love the color of your bag! i need that jacket in my life. I am fully in love with your coat, the stripes just kill me! lovely shoes and caridgan is so prettty. whoooa that jacket is sick. love it. i wanna see your view!! How adorable are you? I love that coat! Fantastic jacket. 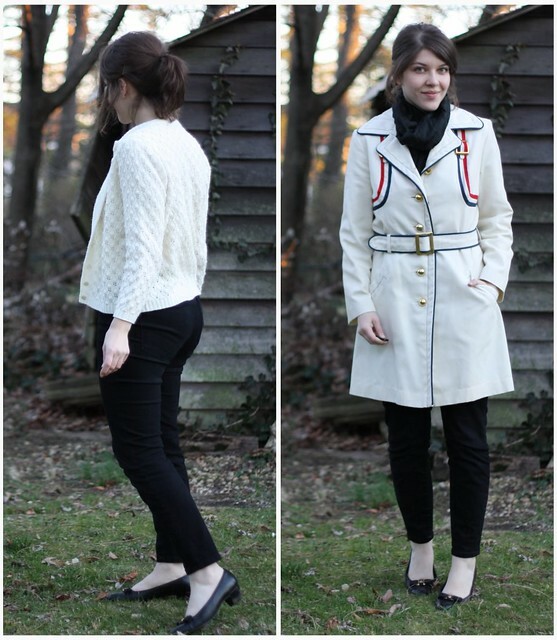 The stripes give it an 80s vibe but the gold buttons and the cut suggest a nautical look. I love a good mish-mash more than anything! You + the cute= two gems. I really adore this coat. What an amazing vintage find! this coat is so lovely... great find. Oh my gosh girl, that coat is so perfect!! I'm super jealous! You styled is so well, classic and adorable. <3. 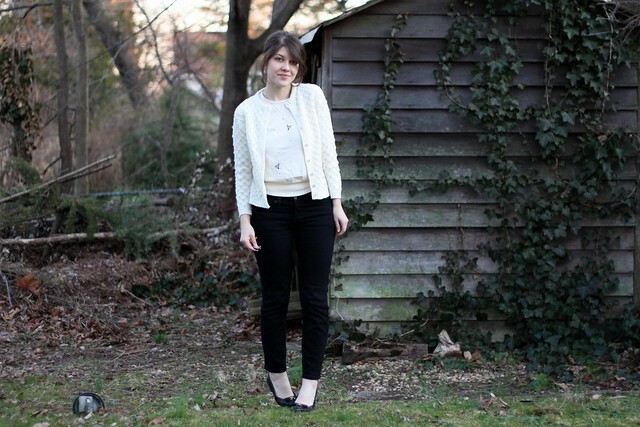 i'm totally having a thing for your white cardigan! So much class! 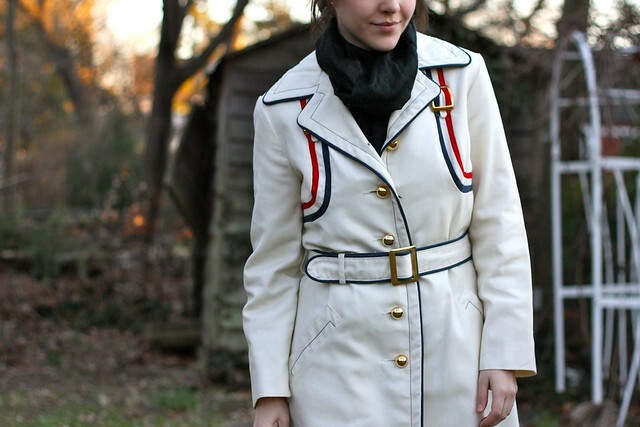 And the detailing on the trench is amazing. You were made for vintage!! !